Welcome back to Harley Quinn's crazy world on Coney Island�now get ready to wave goodbye, because everyone there just might get eaten alive! Harley's gotta protect her neighborhood against an all-out zombie apocalypse! Break out the chainsaws, everybody! Then, Harley must set out on a journey that will take her around the world-and into the clutches of a bizarre robotic enemy! 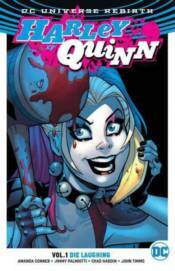 And Harley carves her way through the rock underground of New York City, looking for the criminals who hurt someone she cared about�unfortunately, one of the crooks in question has fallen in love with her. Collects issues #1-7.